Cattle ranching has destroyed nearly all the Akuntsu’s land. Of all the tribal peoples wiped out for standing in the way of ‘progress’, few are as poignant as the Akuntsu. Their fate is all the more tragic for being so recent. No-one speaks their language, so the precise details of what happened to them may never be known. But when agents of Brazil’s Indian affairs department FUNAI contacted them in 1995, they found that the cattle ranchers who had taken over the Indians’ land had massacred almost all the tribe, and bulldozed their houses to try to cover up the massacre. 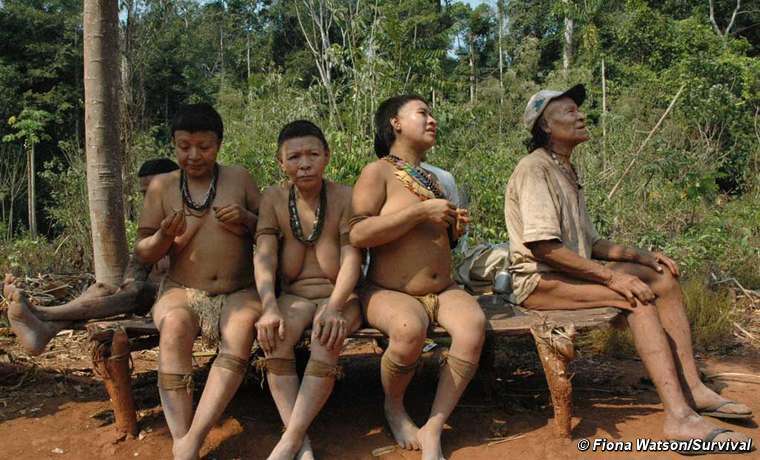 The Akuntsu are a tiny Amazonian tribe of just five individuals. 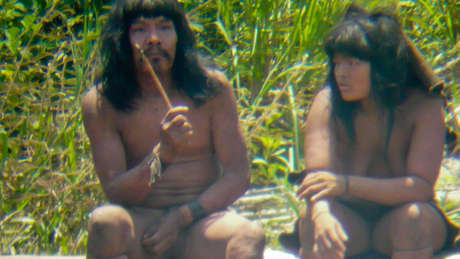 They are the last known survivors of their people and live in Rondônia state, western Brazil. Just five Akuntsu survive. One of the men, Pupak, has lead shot still buried in his back, and mimes the gunmen who pursued him on horseback. He and his small band of survivors now live alone in a fragment of forest – all that remains of their land, and their people. Introduced diseases are the biggest killer of isolated tribal people, who have not developed immunity to viruses such as influenza, measles and chicken pox that most other societies have been in contact with for hundreds of years. In Peru, more than 50% of the previously-uncontacted Nahua tribe were wiped out following oil exploration on their land in the early 1980s, and the same tragedy engulfed the Murunahua in the mid-1990s after being forcibly contacted by illegal mahogany loggers. Christian missionaries, who have been making first contact with tribes for five hundred years, are still trying to do so today. Often believing that the tribes are ‘primitive’ and living pitiful lives ‘in the dark’, the missionaries’ ultimate aim is to convert them to Christianity – at whatever cost to the tribal peoples’ own health and wishes. Members of the New Tribes Mission, a fundamentalist missionary organisation based in the US, carried out a clandestine mission to make contact with the Zo’é of Brazil to convert them to Christianity. Between 1982 and 1985 the missionaries flew over the Zo’é’s villages dropping gifts. They then built a mission station only several days’ walk from the Indians’ villages. Following their first real contact in 1987, 45 Zo’é died from epidemics of flu, malaria and respiratory diseases transmitted by the missionaries. The New Tribes Mission was totally unprepared and did not provide proper medical care to the Zo’é. Their policy to sedentarise the Zo’é around the mission meant disease spread rapidly, and the Indians’ diet suffered because the game they hunted became scarce due to the concentration of Indians in one area. As the Zo’é’s health suffered, they began to lose their self-sufficiency, and became dependent on the missionaries for everything. In response, the government expelled the missionaries in 1991. Since the Zo’é have been left in peace and now receive proper medical care, their population is increasing. 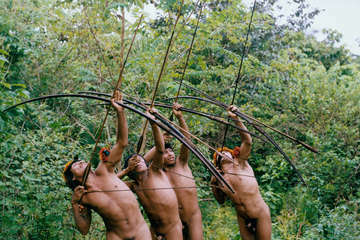 Awá men hunting in the forest, Brazil. 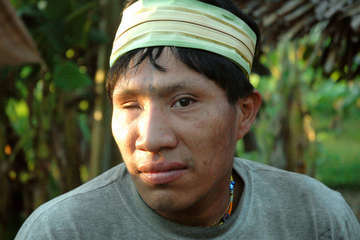 ‘If the Awá Indians have to leave their land, it will be very difficult. We can’t live anywhere else because here there are forest fruits and wild animals. We couldn’t survive without forest because we don’t know how to live like white people who can survive in deforested areas. For years we have been fleeing up these rivers, with the whites chasing us, cutting down all our forest. ‘In the old days there were lots of howler monkeys and deer but today there’s very little left, because the forest has been chopped down. The colonists round here make things difficult for us because they hunt game too. ‘We are getting cornered as the whites close in on us. They’re always advancing, and now they are on top of us. We are always fleeing. We love the forest because we were born here and we know how to live off the forest. We don’t know about agriculture and commerce and we can’t speak Portuguese. We depend on the forest. Without the forest we’ll be gone, we’ll be extinct. 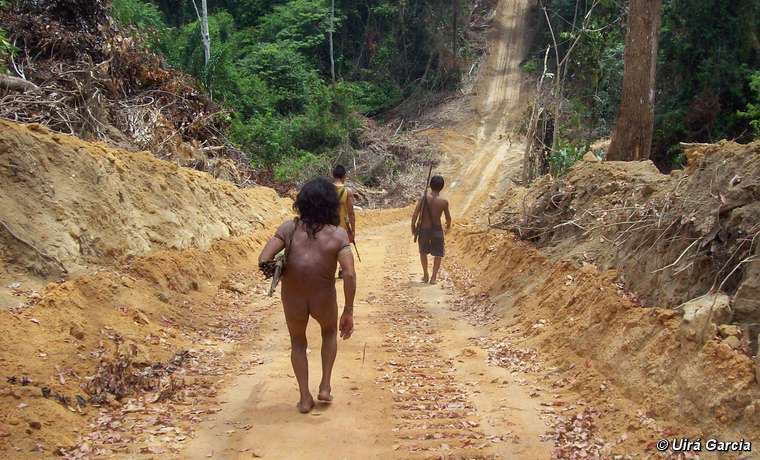 Awá men travel down a road cut by loggers, Brazil. 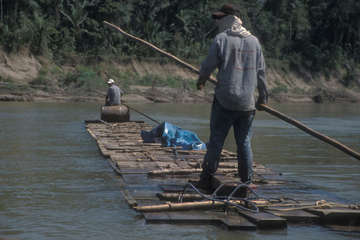 Many areas inhabited by uncontacted tribes are being invaded illegally by loggers. Their presence often brings them into contact with the tribal people; many have died from diseases introduced by the loggers, or even been killed by them. In Peru the situation is especially grave. Areas inhabited by uncontacted Indians are also home to some of the world’s last commercially-viable mahogany stands, and illegal loggers, taking advantage of the lack of any effective state control, have been plundering these areas at will. Logging in Madre de Dios, south-east Peru. In 1970 the Panará people of Brazil numbered between 350 and 400 people, and lived in five villages, which were laid out with complex geometric designs and surrounded by huge gardens. A major highway was bulldozed through their land in the early 1970s. It quickly proved disastrous. Road builders enticed Indians out of the forest with alcohol and prostituted some women. Soon waves of epidemics swept through the tribe and 186 Panará died. In an emergency operation, the survivors were airlifted to the Xingu Park, where yet more died. Soon there were only 69 Panará left. More than four fifths of the tribe had been killed in just eight years. 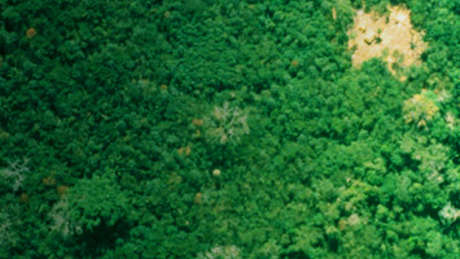 Between 1994 and 1996 the surviving Panará managed to return to the part of their land where there was still forest. In a historic move they sued the Brazilian government for the appalling conditions it had inflicted on them. In October 1997, a judge found the Brazilian state guilty of causing ‘death and cultural harm’ to the Panará people and ordered the state to pay the tribe US$540,000 in compensation. The Jarawa tribe of the Andaman islands saw their land split in two when the islands administration built a highway through their territory. It is now the principal road through the islands. There is not only a constant stream of settlers travelling in buses and taxis, but the road acts as a conduit for tourists, and for poachers targeting the Jarawa’s reserve (which, unlike the rest of the islands, is still covered in rainforest). Jarawa children are often seen by the side of the road, and there is some evidence of the sexual exploitation of Jarawa women. After a long battle, India’s supreme court ordered the local government to close the road, ruling its construction was illegal and endangering the Jarawa’s lives. The islands’ government has defied the court, and kept the road open.